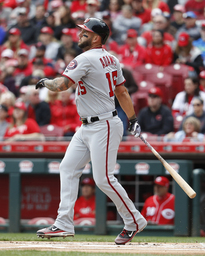 WASHINGTON (AP) Matt Adams is returning to a Nationals team he believes is better than the one he was traded from and has the potential to make even more moves this offseason. "I'm kind of at a loss for words just because I'm excited for this opportunity," Adams said on a conference call. "The team is definitely better than it was last year with the acquisitions that Rizz has made so far this offseason, and I don't think that we're done yet, either. It's an exciting time for fans and we're excited to get things rolling in 2019." "If the opportunity is there for him to come back and he comes back, I think it's going to be amazing," Adams said. "I think everybody on that team would love to Bryce back in right field (because of) what he brings to the table and just how he goes out there and plays the game. He's passionate." Adams might not have known a year ago how much playing time he'd get at first base. This time he's comfortable with the uncertainty. "It's just coming up with mindset of just being ready when your name's called, whether it's on an everyday basis or sporadic here or there, pinch-hitting off the bench and then filling in and giving Zim a blow when he needs it," Adams said. "Wherever the season takes me playing time wise, I'm just excited to be on a winning club and a good chance to go back to the postseason."